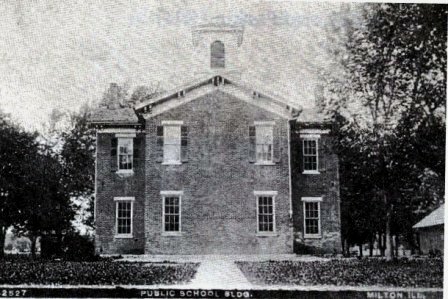 Milton School - 1875 - 1920s? Milton (population 274) is located in lower-western Illinois about 30 miles southwest of Jacksonville and eight miles southeast of Pittsfield. The town was platted in the eastern portion of Pike County about three miles west of the Illinois River. Illinois Route 100 is the main roadway that cuts through the middle of Milton from north to south. Branches of the Little Blue Creek flow through the north and south sides of town. 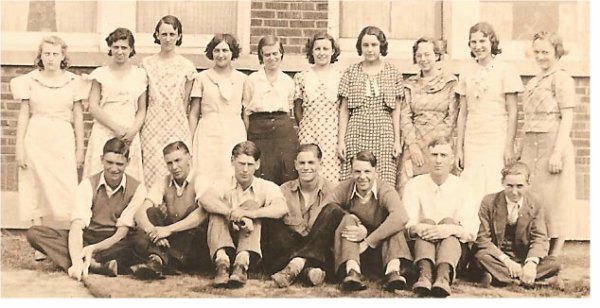 The history of the town and its school system are in need of research. We are fairly certain the townspeople of Milton began a school system for their children shortly after the town's inception. We are also fairly certain that the high school for the town's children was active by the late 1800s. Milton High School served the town for at least five decades. 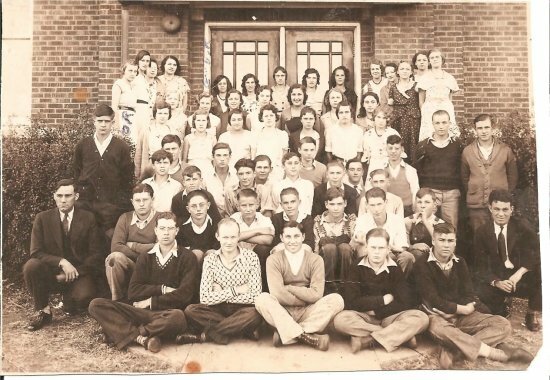 in the early 1950s it was decided to consolidate Milton High School with nearby Pearl High School. The result was the creation of the East Pike School District. East Pike HS subsequently closed in 1979. MIlton students now attend school in Pittsfield. The Milton High School buildings have both been razed. The newer building was razed in 2007. There is a "bandstand" still standing however, a reminder of the town's wonderful past. Milton HS team nickname: "Mustangs"
Thank you to ONA DAY JOHNSTON for the quick facts information. We are certain that Mlton High School offered boys basketball. We are fairly certain that baseball and track were also offered to the boys of the school. We are need of this information as well as the school's fight song, team records, and coaches names for Milton High School sports. 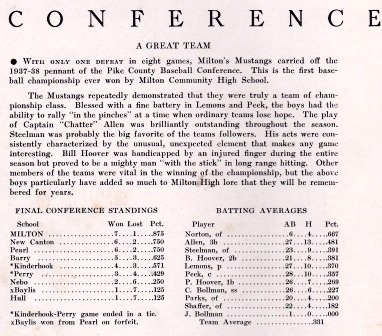 The Milton High School Mustangs' boys basketball program was a true force to be reckoned with in the late 1930s and early 1940s. There has GOT to be a great coach story or a great story of some sort to explain the incredible run that MHS enjoyed. 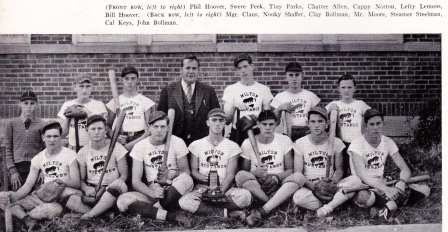 During a ten year period from 1937-38 through 1946-47 the Milton High boys won a total of six District Championships, two Regional Championships, and a Sectional Championship. This Sectional Championship led to Milton's lone appearance in the IHSA Sweet 16 nder the direction of Coach Matt Moore. This was a very rare feat for a District Champion!! Great Job Milton High School! The information we have available from the IHSA website (www.ihsa.org) is listed below. As mentioned above, team records and coach's names of this and other great Milton High School teams are being sought. 1st Rd Beat Jacksonville I.S.D. PITTSFIELD (73): Fox 25, Dunham 23, Sanderson 12, Fraizer 8, Ferguson 5, Bagent 3. MILTON (39): Kern 17, Hoover 11, Smart 4, Bissell 3, Ranfo 3, McEuen 1. **Final boys basketball game for Milton High School. 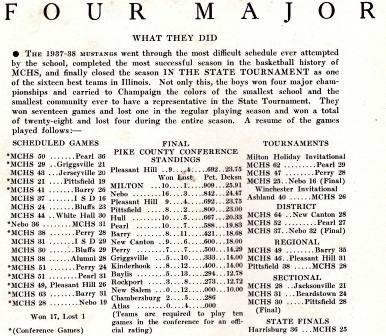 Consolidated with Pearl in the summer of 1955 to form Milton East Pike High School. 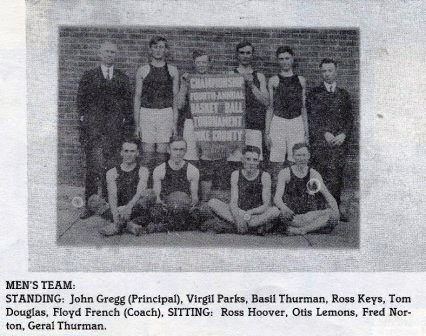 Like several schools of the early 1900s, girls basketball was offered at Milton High. It was in the late 1920s that girls "basket ball" was discontinued as it was thought to be unlady-like. It was eventually returned in 1974. 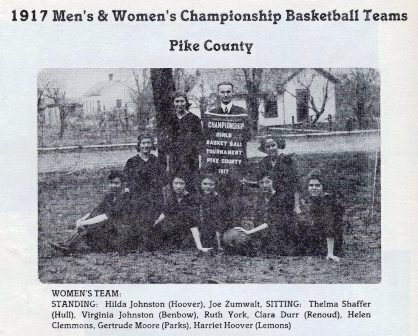 The photo below is of the girls basketball team of 1916-17, crowned champions of Pike County! We know that Milton High School offered baseball as well. In fact, in 1937-38 the male athletes not only traveled to the Sweet 16 in basketball, but were very good on the baseball field as well! The team won the Pike County Baseball Conference Championship with a 7 - 1 record. 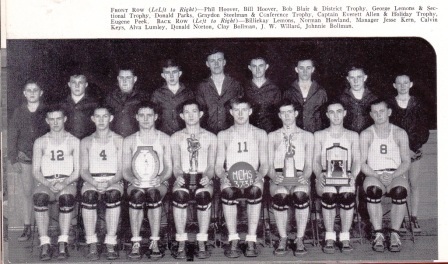 Front Row: Hugh Graham, Everet Landess, Charles Meek, Eugene Stephenson, Roger Reed, Virgil Couch, Melvin Dennison.